← Mom’s Birthday – 2 Cakes! In my French class in high school, we would take an annual field trip to a French restaurant where we were served a multiple course meal. It was always a really fun time and the food was AH-MAZING. One year, I got this chicken with this red sauce on it that I had never seen since then. I couldn’t even really remember the details of it. When I saw the recipe for this chicken, I knew it was it. I was so excited! I anxiously anticipated trying it (and I had to coax Zack into it, because he was pretty apprehensive about the raspberry-walnut pairing). We finally got to try it one night and it was exactly like I had hoped! It was like I was back in high school at the French restaurant. Zack really liked it, surprisingly. I also made some cheese sticks with it, but I will talk about those in another post. Preheat oven to 200 degrees. In a bowl, mix milk, 1/3 cup flour, salt, cayenne pepper, and black pepper. Place bread crumbs and 1/2 c flour in a shallow dish, such as a pie plate, and stir to combine. Working with one piece of chicken at a time, dip into mixture, letting excess liquid drip off. Dredge both sides in bread crumb-flour mixture and place on a platter. Repeat with remaining chicken. Reduce heat to medium. Add vinaigrette to skillet and let cook until reduced to a glaze, about 30-45 seconds. Remove from heat and add cream cheese, stirring with a whisk to blend into sauce. Stir in parsley. To serve, divide sauce between four servings, pouring over chicken pieces. Oooh, this sounds delicious! I think I’m going to have to try this recipe, although I’ll have to alter it to make it gluten-free. Thanks for sharing your “French restaurant” memories! Wow, this really does look amazing. I love all the different flavors in this and will be making this for my hubby when he gets back from military school this weekend! Thank you! These sound delicious, Jenn. 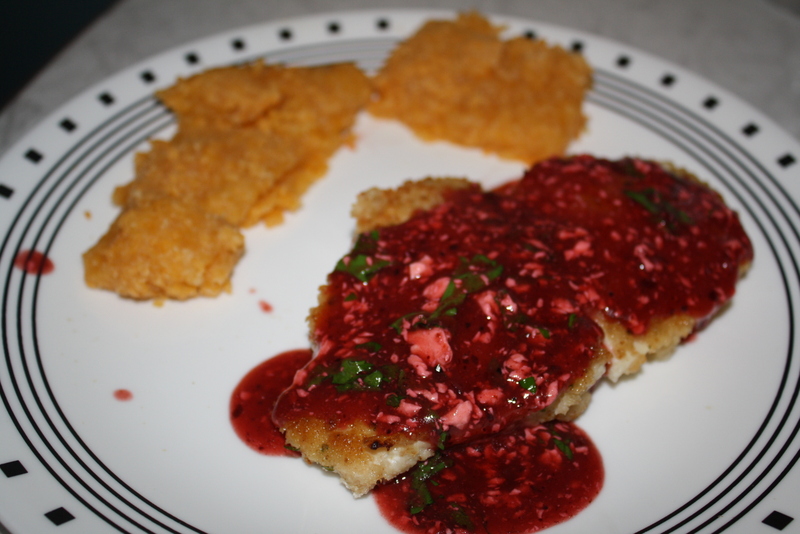 I really like fruity flavors with meats, especially poultry and the raspberry walnut sauce sounds great! That raspberry walnut sauce look fabulous! The raspberry walnut sauce looks intriguing, very creative. Thanks for sharing! 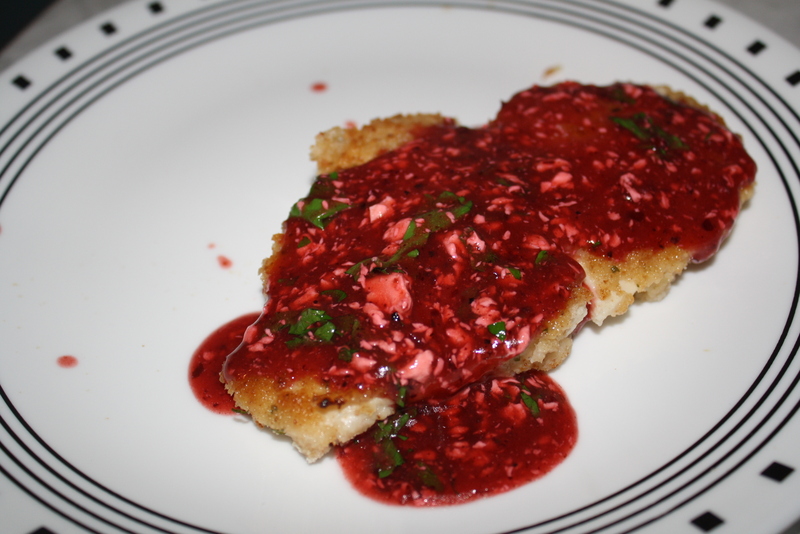 Like yourself, I was searching chicken and raspberry sauce recipes (a dish that I was already familiar with) when I happened upon this one. Voila! I believe the breaded/crusted version of this dish is the one I’ll prepare tonight using cream and shallots and fresh razz for garnish. It looks fabulous and I can’t wait!